It’s Flag Day in the U.S., so inevitably the conversation turns at some point to the Pledge of Allegiance and the claim that the U.S. is (or has been) “One Nation, Under God.” This is often met with one of two responses. On the one hand, this phrase is seen as the intrusion of the religious into the public sphere, as a violation of the separation of Church and State. On the other hand, this phrase is seen as a last bulwark against a tide of godlessness, or a reminder of an era when the U.S. was a Christian nation. Neither position captures what I see as a question of idolatry. On the one hand, I see the use of the phrase “Under God” as an appropriation of religious language for the service of state power. The evils perpetuated by the state are sanctified by the use of the dominant religious language, and the state’s purposes are identified with divine purposes. On the other hand, I think of Jesus’s words at the Last Supper. Before he was executed by the state*, Jesus told his followers that, “By this everyone will know that you are my disciples, if you have love for one another.” My first concern is that love, not national testimony, is the mark of the disciple. Much more importantly, however, there is a deep irony in the appeal to a state as representative of Christ. All states and all empires are predicated on violence. No state or empire is “Under God.” God is under all states and empires: states and empires kill God, every day, all over the world. In Turkey, in Syria, in Guantanamo; by gun, by starvation, by drone. 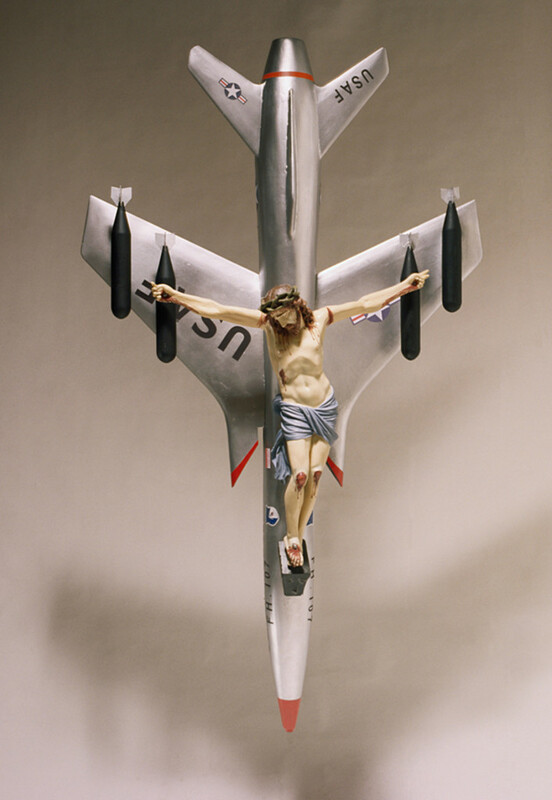 In León Ferrari’s “Western-Christian Civilization”, we see a crucified Christ nailed to an American war plane. Is Christ a weapon to be deployed against a national enemy? Is Christ crucified as a victim of war? I think both are the case: when we use Christian language to prop up the state, Christ is crucified by being used as a weapon. The desire for power over others is a dominant form of idolatry in the contemporary U.S. The State desires the power that religious sanctification offers. The Church desires the power that national recognition offers. I believe that for the Christian, the desire for power over others must be renounced, and that all attempts to sanctify power over others with Christian language must be confronted as counter to the way of the God who is daily murdered by the State. 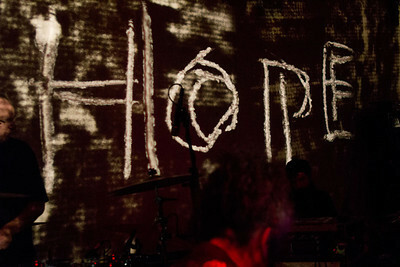 There is hope in the fact that all flags burn. *Admittedly, this is an anachronism on my part. Jesus was crucified by an empire, not a state, though this only enhances the connection to the current U.S. context.